On 14 April 2015 at 20:10 UTC, one day late due to an aborted launch the day before, SpaceX launched a Falcon 9 rocket with the Dragon CRS-6 resupply mission to the ISS. I watched the live webcast of the launch, and then 20 minutes later I watched the Dragon craft make a pass through Orion low in the West, before entering Earth shadow. With a pass so low in the west in the evening, I expected it to be faint, but it actually was easily visible by the naked eye reaching mag. +1.5 (about as bright as the brightest stars in Orion, barely fainter than Betelgeuse which it passed close by [edit: but see below...]). 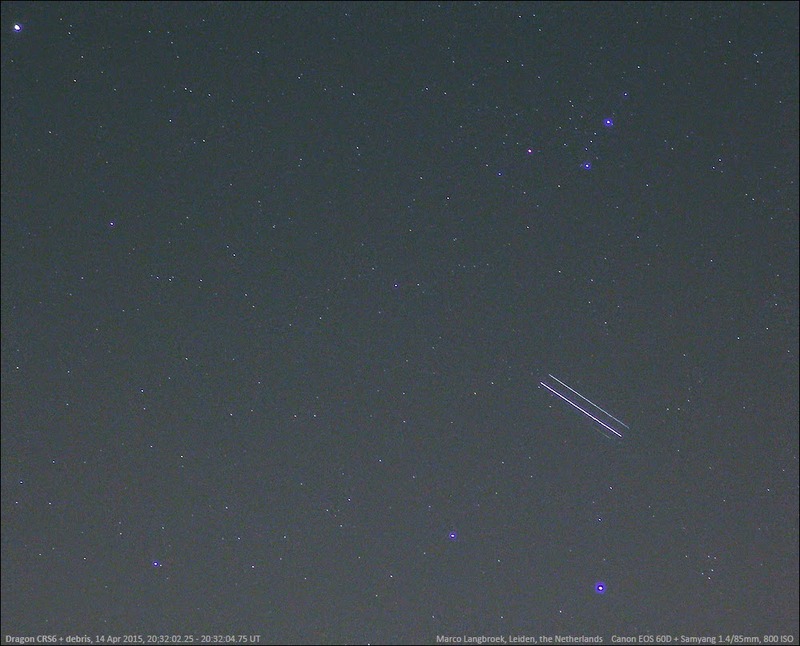 It was some 30-45 seconds late on Jon Mikel's estimated initial orbit. 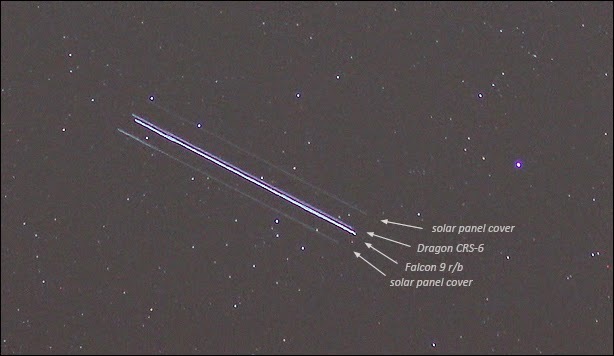 My images show up to three additional, fainter objects (I did not see them visually) close to the Dragon (see image above which shows them al three). These are the two jettisoned solar panel covers, and either the jettisoned nose-cone or the Falcon 9 upper stage (probably the latter). Unlike the Dragon, which is steady, these three objects are irregular in brightness, as they are tumbling. 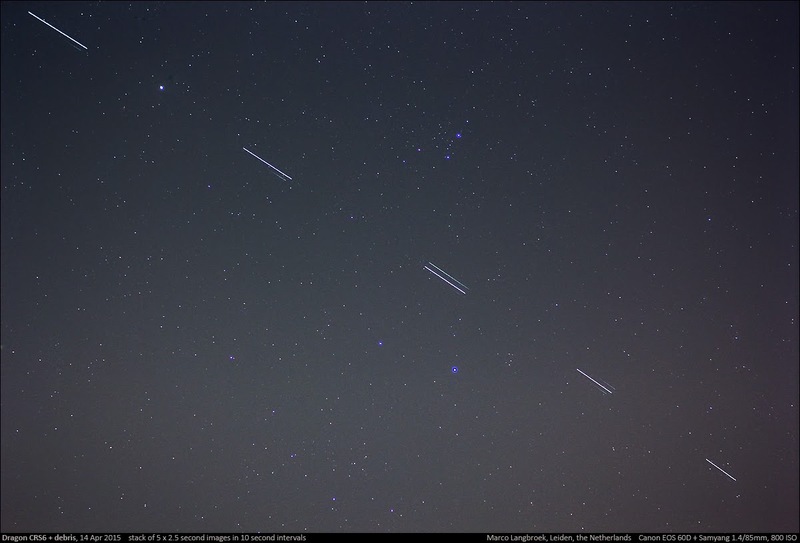 Dragon and ISS will berth on April 16 and I hope to have some opportunity to observe them close together. I think the nose-cone is not what is visible on your first picture. This was jettisoned much earlier (could be seen falling down quickly on the live feed) in the flight. The two outermost tumbling objects are most likely the solar panel covers. Isn't the brightest trail the Falcon 9 upper stage and the fainter trail above it (second from the top) the actual Dragon?? 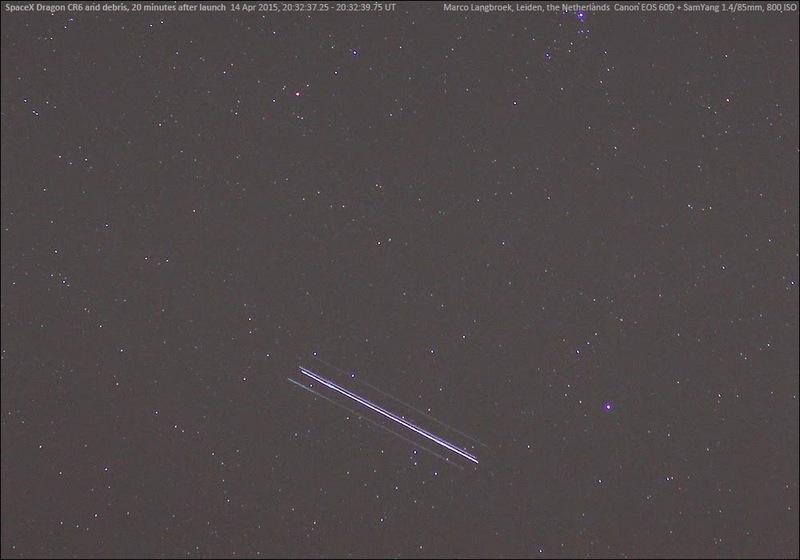 This fainter trail (Dragon) is also ahead of the brighter second stage (which is likely). I spotted Dragon with the naked eye, thought through binoculars the tumbling objects where clearly visible! the Falcon 9 upper stage and the Dragon are about equal in size. From previous Dragon mission observations, I know the Dragon itself is bright. The bright object on the current images is also the steady one in brightness. This fits the payload (I would not expect the payload to tumble - then something went horribly wrong!). 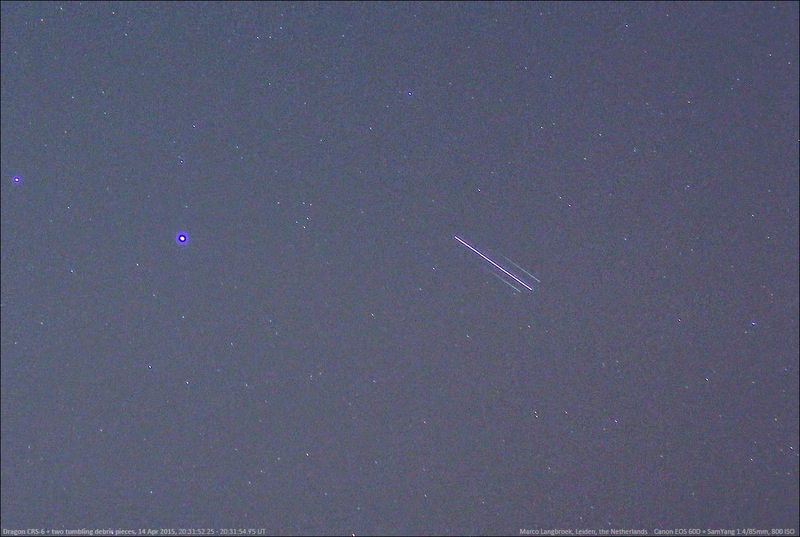 The Falcon 9 upper stage is probably the fainter object very close to the bright trail on the image that shows all three. Is it perspective then, that Dragon looks behind the second stage? Or is the second stage already in a lower orbit, so traveling faster and so ahead of the payload? How long was your time exposure? Erwin, I will be trying to check that out later today. It is an interesting question which object is the real payload! It depends a bit if the r/b stage was ejected up or down, in a higher or lower orbit. if in a lower orbit, it will get ahead of the payload. In spatial terms, we are looking towards the objects while they approaching us from the west. Thomas: all individual still images are 2.5 seconds exposures. Thank you very much for your credits. Using the data of the USPACECOM and the fitted orbit that I've passed you privately yesterday using Leo Barhost's observations looks like the highest object in the sky (highest elevation) is the Dragon and the lowest one the 2nd stage. There is one piece of debris even higher than the Dragon too. Movie: Dragon CRS-6, The Twilight Saga!